Welcome to Cerkl's updated Content Creator. If you're wondering what changes you might find, you've come to the right place. We've heard you, we know you're wearing a million different hats and have crazy busy schedules. We know you want a quicker, easier and more intuitive way to share your stories and events with your audience. We’ve updated our text editor to give you more formatting options. Our new editor gives you more font size options and allows you to quickly add files, links, and videos. Our image systems has been updated to accept drag and drop files. You can even add gifs to make your stories stand out. Most of the time, you already have your images or graphics ready to go on your desk top. 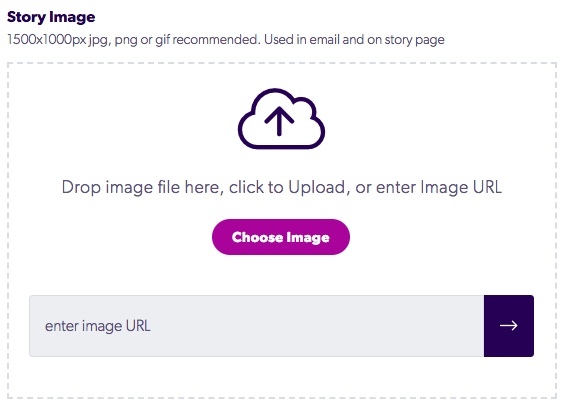 To make it easier to update you Story Images now, you can simply drag and drop directly from your computer. Don't worry, if you prefer to upload the old fashion way, you can absolutely do that as well. Sometimes when you are using a web publishing software, you feel like you have to learn a new language to master it. We are here to save you time, so our new Content Creator is simple to understand and use. No fancy software terms. Publish Date: the date you want the article to become available to your audience within their newsletters, on Aptly or within the Content Archive. Expiration Date: the date you expect this article to no longer be available to send in any future newsletters, appear within the Content Archive or show up on Aptly. Don't fret, all analytics for expired content is stored within your Content Manger. 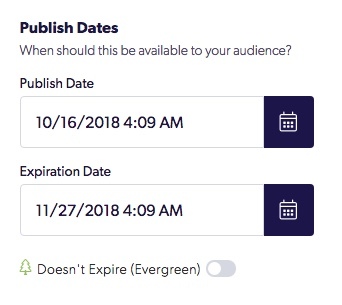 Doesn't Expire (evergreen): meaning, this article doesn't need to be hidden from your audience after a certain period of time, it's basically like that cookie that you've saved for a rainy day.... who doesn't like cookies that last forever? Not every piece of content is right for each member of your audience, so we’ve made distribution easy to control at the story level. Cerkl’s artificial intelligence works wonderfully in matching your message to the right audience, but we know some messages require a high priority. With the Priority Settings, you have the control. Choose to let Cerkl’s A.I. match your message to the audience, or you can opt to make your message appear in every audience member’s feed. You can easily search and select Segments in this section as well and control whether or not this story appears on Aptly. 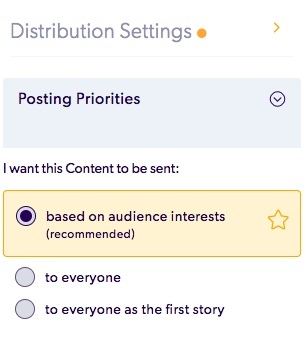 Want to add specific distribution settings to your next piece of content? Simply, click the orange gear icon in the top right hand corner of the content creator & wallah! Now, it's easy to denote the priority level for each individual article. Want to be sure everyone in your audience get's this article? Sweet, choose "to everyone" from the Positing Priority drop down. How about as the first story your audience sees in their next newsletter? You can do that too, choose, "to everyone as their first story." Either option will allow you to Pin your article for a specific period of time, meaning, the article will be delivered in every newsletter until the date you've chosen. What about sending to a specific Segment of your audience? Not a problem, you can even search the specific segment you're looking for (hoping to save you a little more time :). We hope you enjoy the new, easier to use Cerkl Content Creator. If you have any questions, suggestions or just want to send a kudos to our amazing tech team, send us a message using the chatbot in the bottom right hand corner of any cerkl.com page.